Services for Doris Elaine Rodgers will be held at 2:00PM, Wednesday, April 26, 2017 at Brownfield Church of Christ with Rev. Bob Reynolds officiating. Burial will follow in the Meadow Cemetery under the direction of Brownfield Funeral Home. Visitation will be held from 6:00PM until 8:00PM, Tuesday, April 25, 2017 at Brownfield Funeral Home. Elaine passed away Sunday, April 23, 2017 at her home in Brownfield. She was born August 3, 1933 in Ovalo to Elbert and Ida Inez Tucker. 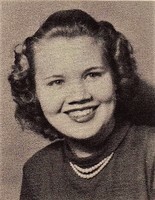 Elaine attended the Jim Ned School System in Tuscola up until her senior year. She graduated from Lubbock High School and then attended South Plains Community College. She married Jimmie Dale Rodgers December 22, 1951 in Brownfield. Elaine was a member of the Brownfield Church of Christ. She was a very dedicated wife, mother, and grandmother. She worked with the Cub Scouts as Den Mother and was a member of the Brownfield Volunteer Fire Department Auxiliary. She taught Sunday school at South Side Church of Christ and the Crescent Hill Church of Christ. Elaine is preceded in death by her parents, sister, Barbara Tucker Davis, brother, Joe Johnston and granddaughter, Shannon Ryan. Elaine is survived by her husband of 65 years, Jimmie Rodgers; three children, Sherry Rodgers of Lubbock, Kenneth Rodgers of Brownfield, Tracy Rodgers and wife Lisa, of Levelland; 8 grandchildren, Laura Ryan of Waynesville, MO, Craig Graves of Gooding, ID, Stacia Ryan of Brownfield, Heather Crawford of Lubbock, Kari Anderberg of Thief River Falls, MN, Kassi Rodgers of Slaton, Shauna Rodgers of Tuscaloosa, AL, Carly Rodgers of Lubbock; 22 great grandchildren and one on the way.